Heavens, yes, I know it's been forever. I've been crafting, mostly under the radar, just for pleasure or for FS reviews. I've also been adding to my log cabin knitted blanket, which has grown quite large. And it's cold in our pre-central-heating house, which means my hands ache after a day of crafting. Nevertheless, I found this Snowy Bird Pattern by Larissa Holland a few days ago, and instantly had it purchased, downloaded, and ready to craft. 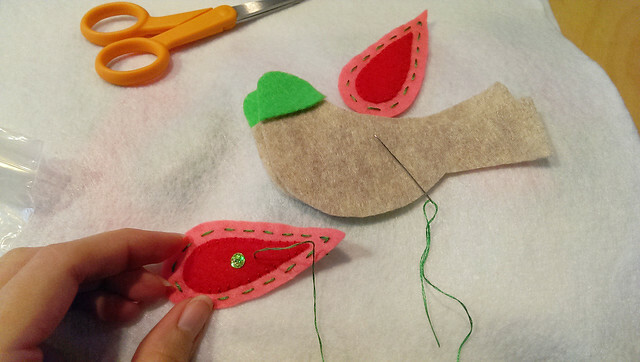 I finished my first bird after about 5 hours of stitching, which included a hunt in my house for sequins. All I found was an iridescent green sequin ribbon which I've been patiently detaching the sequins from, bit by bit. I liked my first bird, though it was far from perfect. 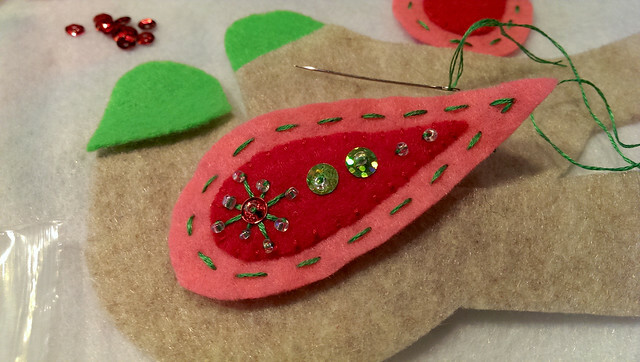 Against Larissa's sage advice, I used the cheap acrylic felt I owned, because I prefer to use what I have, and because I'm too darn impatient to wait for felt. Also, it would likely be Christmas before it arrived at my house. 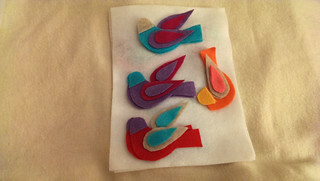 :) I'm an old hand at crafting with cheap acrylic felt - I kne exactly what would be frustrating, and have formed my own workarounds over the years, so it went fine. 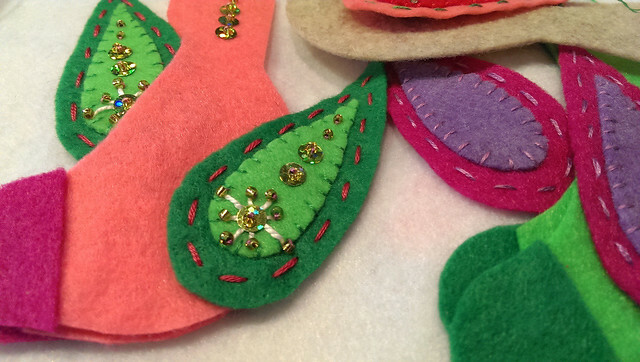 I've never, ever crafted with sequins before, and had you asked me my preference, I would have previously classed them in the same taste category as bedazzlers and puffy paint - not exactly my cup of tea. But there's something about the way Larissa incorporates them into her design that is so elegant. And they're so sparkly and dazzling. 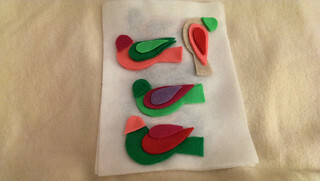 In no time, I had the makings of 10 more birds all cut out and ready to stitch. I admit, I went a bit bonkers, but there is something so addicting about this pattern, I can truly say that almost every color combination I put together looked great. 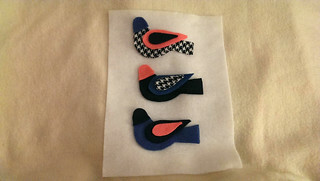 Also, there's something a little Charley Harper about the geometric unstitched bird shapes... these would look great as papercuts, too. 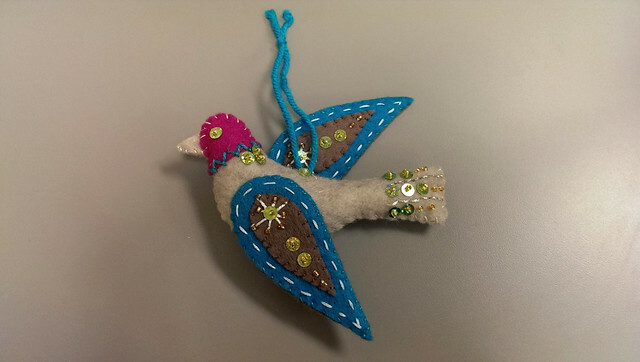 I've been using every day at lunchtime to sit down with needle, thread, sequins, and beads. When I first stitched these with a drink at Starbucks, one of the baristas came up to look at them at chat with me. I have to say this is one of my favorite things about crafting - the delicious inner calm and perfect silence you experience, only when creating, drawing, stitching, whatever. And the innate curiosity just about every human being has about crafting - I like how it breaks down walls and can bring the shyest of people together for a conversation.